Fancy experiencing the Dolomites - UNESCO World Heritage close up? Fancy something a bit special? Then let us recommend the „Giro delle Cime“ tour, the summit tour on skis. experience more on the “Giro delle Cime”! 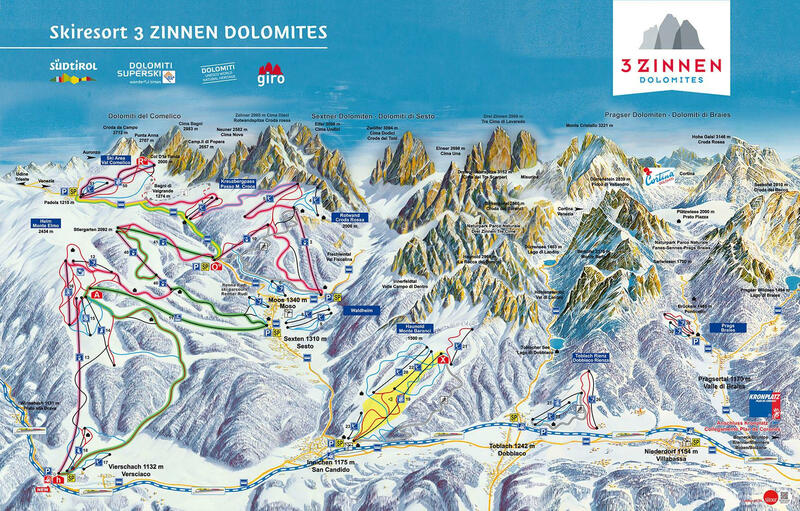 With 34 km of slopes and 5,600 m elevation gain, ski, discover and marvel at the majesty of the Dolomites as you journey through some of this UNESCO World Heritage Site’s most beautiful areas in an unforgettable winter world (some segments with the SALTO ski shuttle). The short version„Giro delle Cime“ starts in Versciaco and turns round at Croda Rossa. On the extended version „Grande Giro delle Cime“ you will reach the Skiarea Val Comelico. Prefer not to ski alone? A professional ski instructor would be happy to accompany you every Wednesday and Sunday - for free! We will ascend to the highest point of the tour at 2,200 m from the valley station in Versciaco/Monte Elmo. Take your time and witness the first rays of sun in peace whilst enjoying a coffee and fantastic panoramic views of the surrounding mountains before setting off with the Orto del Toro cable car. Once you have greeted our reindeer herd and the family of giant snowmen, head to the Passo Monte Croce pass where you can ski in the footsteps of Marc Girardelli on the slope named in his honour. From the top of the t-bar, continue on to the Bagni di Valgrande area. Once there, you have to get on the ski bus SALTO to get to the Ski Area Val Comelico. And back to the mountain with the chairlift Col d'la Tenda, where you can try out wonderful Italian dishes in the Col d'la Tenda hut. Did you already notice that it looks a little different here than at the starting point of this adventure trip? That's because you have now crossed a provincial border: You are no longer in South Tyrol, but in Belluno! Take the SALTO ski bus towards Signaue to return to South Tyrol. From here, ascend with the “Drei Zinnen” gondola lift up the Orto del Toro mountain and proceed to the middle station. After a short journey with the Orto del Toro cable car, ski via the black slope to the valley station of the Monte Elmo panoramic gondola lift in Sesto, which will transport you back to the Elmo summit. This is the last round and a challenging one at that! Return back to the starting point in Versciaco via the 4.75-km-long Helmissimo slope.